As much as we enjoy our cosy winter nights in, we always find ourselves craving the colour and vibrancy that comes with the warmer months. 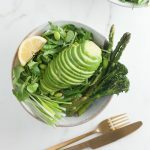 One of the most iconic vegetables this time of year is the humble asparagus. Whether it’s fried or simply sliced raw for salads, it’s a real favourite in our household. 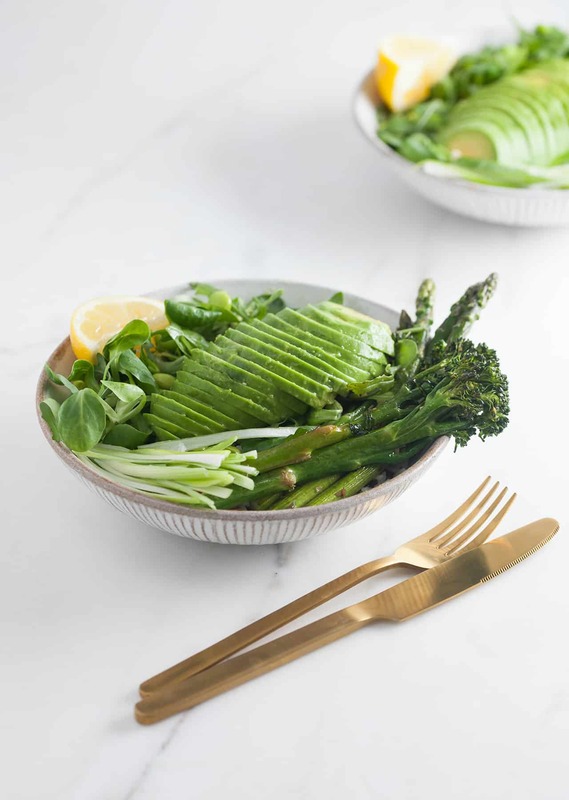 For our latest creation, this delightful green goodness bowl, we gently fry it in garlic, ginger and a host of delicious flavours, and serve it alongside some nutrition-boosting veggies. 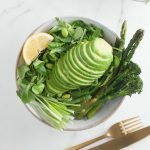 From healthy fats in the avocado to Vitamin C in the broccoli, this is the perfect bowl if you want to take care of your body and mind. Oh, and don’t forget, if you love this, then you’ll totally love our debut 5-ingredient cookbook So Vegan in 5, which is available to buy right now. Cook the rice as per the packet instructions until light and fluffy. Transfer the edamame beans to a bowl and cover with hot water from a kettle. Leave to sit for 10 minutes while you carry on with the next steps. Heat a little oil in a frying pan on a medium – high heat. While the oil heats up, trim the ends off the broccoli and asparagus, then add both to the frying pan along with pinches of salt and pepper. Fry for 10 minutes, turning occasionally. Peel and roughly chop the garlic and ginger. Then prepare the dressing by combining the soy sauce, sesame oil, maple syrup and 1 tbsp of juice from the lemon. Add the garlic, ginger, and 1-2 tbsp of the dressing to the frying pan, and fry everything for another 2 minutes, stirring the veggies occasionally to prevent them from burning. Remove and discard the stones from the dates. Then roughly chop the dates and the almonds, and add both to a mixing bowl along with the cooked rice, 1 tbsp of juice from the lemon and a pinch of salt. Stir to combine. 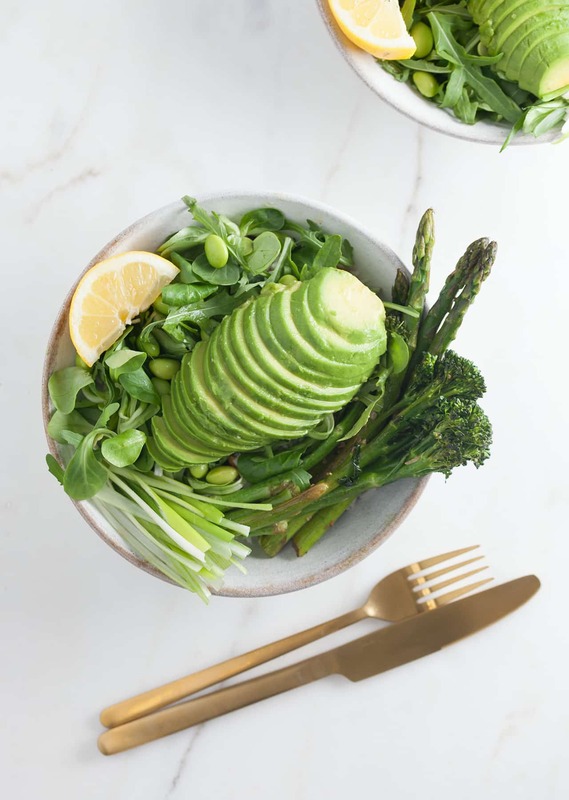 To build the bowls, add half of the rice to each bowl, followed by half the asparagus and broccoli. Then top with a handful of mixed leaves. Drain the edamame beans and sprinkle half over each bowl. Slice the spring onion into strips and add half to each bowl. Slice the avocado in half, remove the stone, peel each half and slice thinly. Place half a sliced avocado in the middle of each bow. Top each bowl with a drizzle of the remaining dressing and any leftover juice from the lemon. Bon appetit!